Genetec has announced that it has integrated ShotSpotter gunshot detection technology from SST Inc., into its unified IP security platform, Security Center. Thanks to this integration, police departments and security professionals will be able to receive more actionable information, gain rapid access and detailed location insights when a gunshot situation occurs. When 9-1-1 calls are made to report a gun shot, oftentimes the information provided is inaccurate, or insufficient. Without knowing exactly where to respond, police can waste valuable time and resources driving block by block looking for evidence as victims lack aid and criminals escape the scene. ShotSpotter uses wide-area acoustic surveillance that automatically gets activated when gunfire occurs, providing comprehensive outdoor coverage on campuses and in complex urban geographies. ShotSpotter sensors and cloud-based analysis software triangulate and pinpoint the precise location of each round fired within seconds, the number of shots fired and provide an immediate gunfire alert with an audio clip. Detailed incident data is immediately sent to SST's Incident Review Center (IRC), a secure data processing and alert validation facility, where acoustics experts analyze the data and qualify the incident in real-time 24/7. Once validated, an alert is sent directly into Security Center, all in under a minute. "Detecting, precisely locating, and alerting police within seconds to gunfire is key information used by law enforcement and security personnel to more effectively protect and serve communities. Integrating the real-time gunshot data with the video capabilities provided by Genetec is a game-changer that enhances the information police receive, ultimately helping them solve crimes, deter future crimes, and make communities safer; which is a goal we all share," commented Damaune Journey, VP Security Solutions at SST, Inc., the global leader in gunfire detection and location technology. 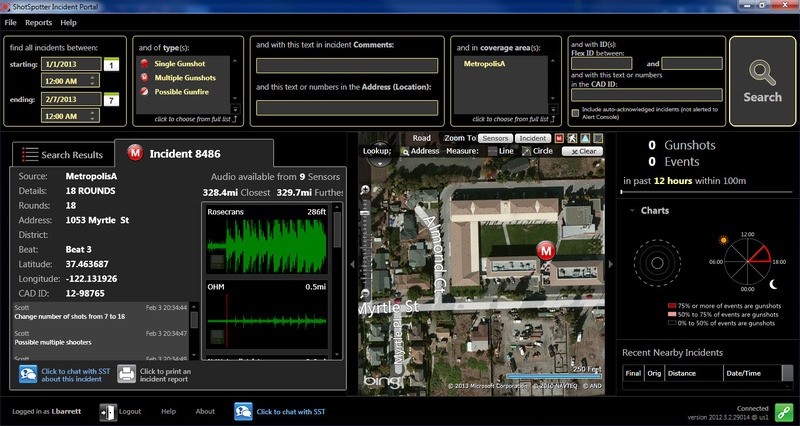 Once the alarm is triggered within Security Center upon gunshot detection, operators can quickly access video and other related data surrounding the location of a gunshot alert, and immediately visualize it on Security Center maps, leveraging the dynamic visualization capabilities of the Security Center Plan Manager. Pan-tilt-zoom (PTZ) cameras are instantly aimed at the gunshot location, and bookmarks are automatically created on the Security Center timeline. Operators can then follow active shooter events in real-time through the map interface and live video to make informed decisions. Security Center is also able to display relevant metadata on the map, such as type of gunshot, number of rounds, address, district, etc., as well as give operators access to detailed reports of past alerts for statistics and data analysis purposes. As a result of this integration, law enforcement officers and security teams will also benefit from improved tactical intelligence. They will be able to get to the exact scene of the incident faster, stay safer and have the ability to engage the shooter, interview witnesses and collect key evidence.